Tetrahedron with faces of equal areas is isosceles. Plane $AMP$ is orthogonal to $EBC$ and, therefore, also to the plane $ABC$ such that $AP\perp BC.$ Similarly, $DQ\perp BC.$ Now, triangles $ABC$ and $DBC$ have the same area and the same base $BC$ wherefrom the altitudes to the base are equal: $AP=DQ.$ This implies that the triangles $AMP$ and $DNQ$ are congruent, so $MP=NQ.$ Thus $M$ and $N$ are the same distance fro $BC.$ Since $A$ and $D$ are also at equal distance from $GH,$ it follows that $BC$is the projection of $GH$ onto the plane $ECFB;$ hence the planes of $GBCH$ and $ECFB$ are orthogonal. 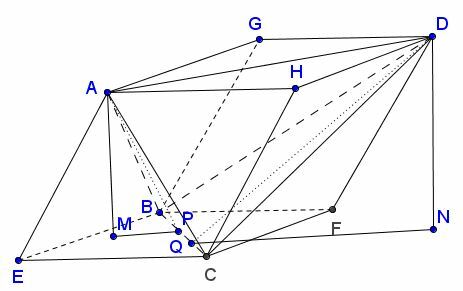 This shows that $CH$ is orthogonal to both $EC$ and $CF.$ A similar argument gives $CE\perp CF,$ thus the parallelepiped $AHDGECFB$ is a cuboid and, therefore, the tetrahedron $ABCD$ is isosceles.